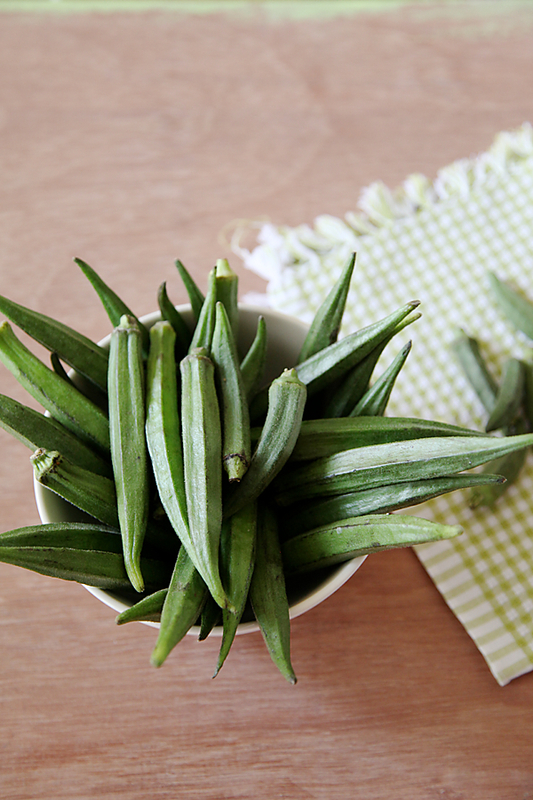 Okra or lady finger as we call it here in India brings back deep memories embedded in my mind. It takes me back to the time when I travelled with my 40 day old baby to my parental home for post natal care, where I was nurtured and cocooned in the comfort of my parents home. It so happened that part of this nurturing involved eating okra every single day for the many weeks that followed thereafter. Supposed to be good for the new mother and the baby, they were part of my lunch, every single day! Naturally, due to over indulgence, I couldnt look at these innocent vegetables for a good couple of years! And this meant that my dear husband had to go without his favourite vegetable for a really long time! 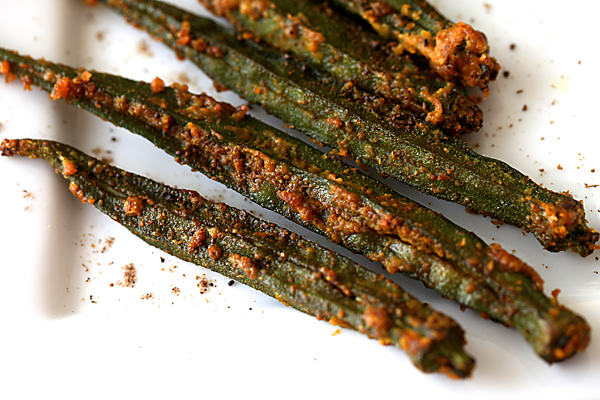 My aversion to okra or lady finger seems to have finally disappeared and I find myself cooking it often in different styles and methods. I have come across many people who dislike okras and more often than not it is due to improper cooking methods, making it slimy and unpalatable. Cooked in the right way, okras can be one of the most delicious vegetables. They are often deep fried to get a crispy external texture, but like me if you are not very fond of deep frying then you will love this alternate way of cooking them. This was also one of the dishes featured in the TV show I did in 2012. Many of you have asked for this recipe and this one is for all of you! You could serve this as a starter or as a side dish to a main meal. Hope you all love this as much as I enjoyed making and eating it today! 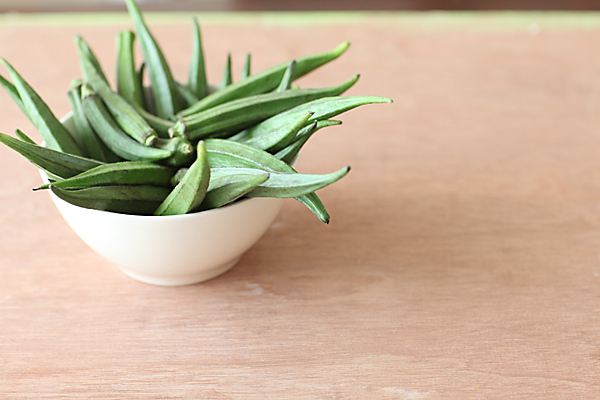 Choose tender young okras for this dish. 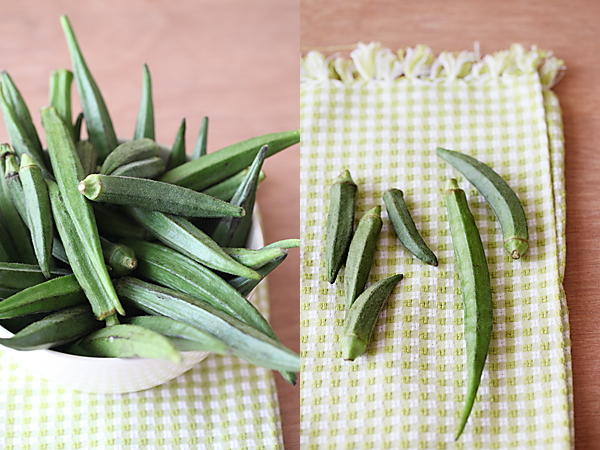 Keep in mind that the cooking time can vary based on the size of the okras. 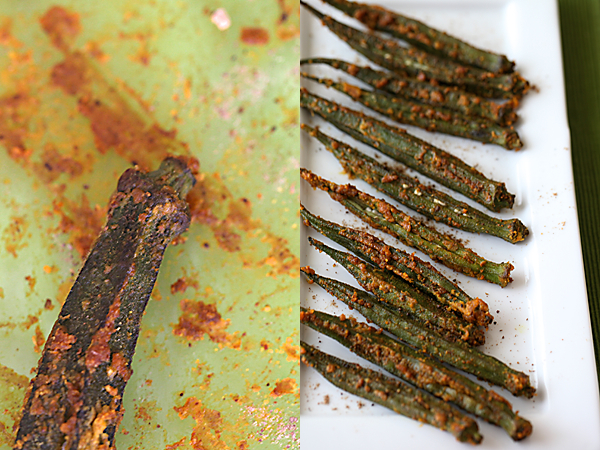 My mom makes a very similar style of spicy okra except that she deep fries it. I love that this version is healthier. Will surely give it a try. 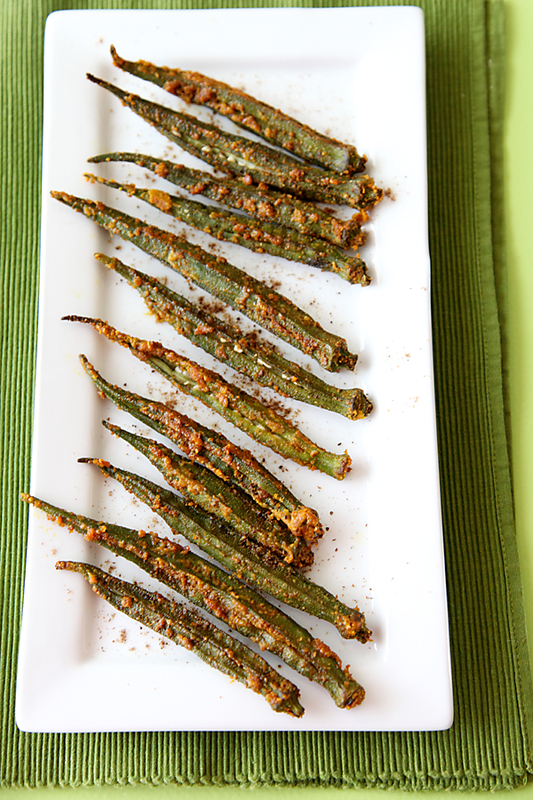 okra is our family favorite.. baking okra is a nice idea! I'm see this at 6.50 in the morning and my mouth waters 🙂 I love baking with Okra, especially thinly slicing them and baking them to a crisp, perfect for adding to raitas and Mor Kozhambu! I'm going to try your method soon. Never thought of baking them. Great idea. Will try it out sometime. We don't get fresh okra in supermarkets where I live in Europe. I have to travel bit to buy them from the Indian store. But everyone in my family loves it so we don't mind! thanks a lot for this recipe. i was looking forward to it. Nandita: That sounds like a great idea…I remember reading it in your blog. Shruti: I think this dish is worth the travel! I hope you make it for your family. He jus loves that and jus yest he said can you try something as well with this type of a masala…. Looks lovely Anushruti. The okras look so fresh and and unusually long. i guess in the US they look so short and stunted. What a great idea to bake them! Ashwini: That's quite exciting to know. Thanks! Bhavana: I'm amazed with your interest in cooking up delicacies for your family! Shoba: We get both varieties here! Hi, made this today… tasted quite nice, but only thing, wasnt crispy. U think I did something wrong…? Only thing that I can think of is that, I didn't put th okras immediately in the oven after adding th spice mix, but let them marinate in th spice mix for a few hours .. U think, this could be the reason for softness in the okras? Ashwini: I'm glad I could be of help! Taruna: You neednt marinate this for hours. IT would make the okras soggy with the reaction of the salt and the oil. Anushruthi…. A big hi from Sowmya. I am a food blogger too. You have a great space and I enjoyed watching your stuffed Brinjal Dum Biriyani…. Will try it soon and give you the feedback. I tried this. Must say I couldn't resist eating more. Along with curd rice, its a winning combo. Mine took 25 minutes and I baked it at 210 degrees. I guess the time and temperature depends on how fresh the okras are. I'm glad to have found this recipe – it's great. I wouldn't say the okra ever got crispy but it was really good. I didn't have chaat masala to sprinkle on at the end and it was still delicious. This is very yummy. I made it in airfryer!